Temperatures this afternoon reached 5-10 degrees warmer than yesterday, as a light breeze out of the south has brought milder temperatures to our area. High temperatures will continue to gradually warm through the rest of the week. Two areas of moisture to our south will merge, heading north toward the Great Lakes. Snow currently over Colorado, New Mexico and Nebraska will join a lot of moisture currently across the Deep South. 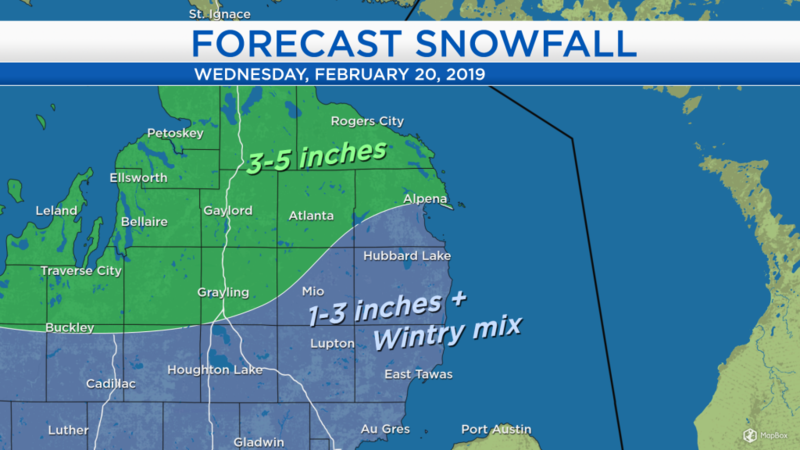 Around Northeast Michigan, some snow will arrive midday or early-afternoon tomorrow and continue through tomorrow evening. Tonight will remain quiet, partly cloudy with light winds as low temperatures drop to 7-13 degrees around Northeast Michigan. 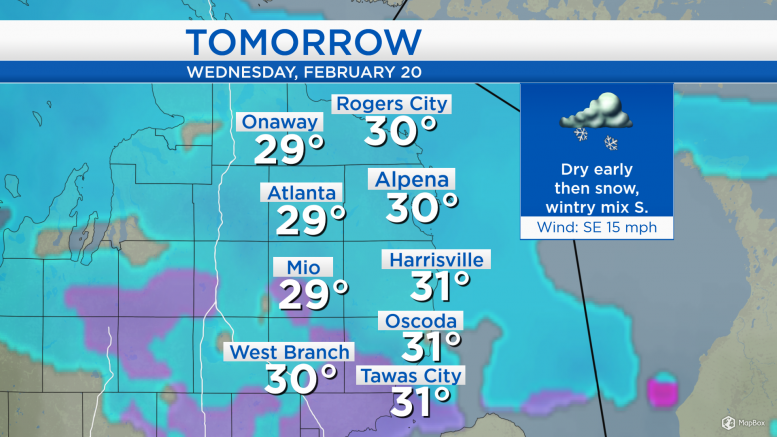 Tomorrow morning will likely start mostly cloudy and dry, then snow will move in from the south. 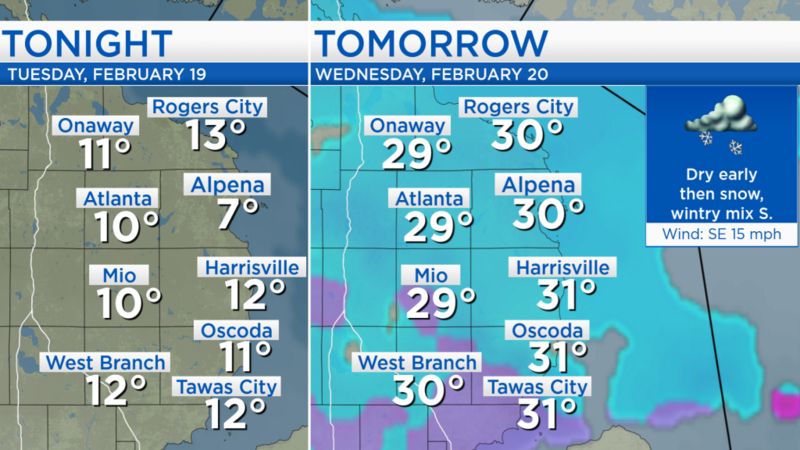 For the areas colored in purple (Iosco, Ogemaw and Arenac counties), some freezing drizzle is possible late tomorrow-tomorrow evening, creating icy surfaces. Elsewhere, the precipitation type will remain as snow, colored in blue. High temperatures will reach close to 30 degrees, but it will likely take until shortly after sunset to reach the high temperatures tomorrow. Total snow accumulations will be greatest north and west of Alpena, where 3-5 inches of snow are forecast, shown in green. South of Alpena, lesser snow amounts of 1-3 inches are expected, shown in blue. A bit of wintry mix is possible south of M-72 late tomorrow, which reduces snowfall amounts. 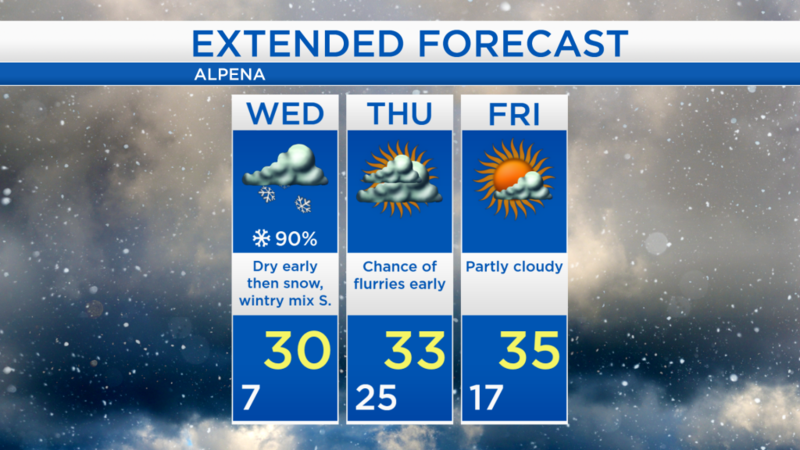 Some snow will arrive tomorrow, but not a whole lot is expected especially south of Alpena, slightly more north. 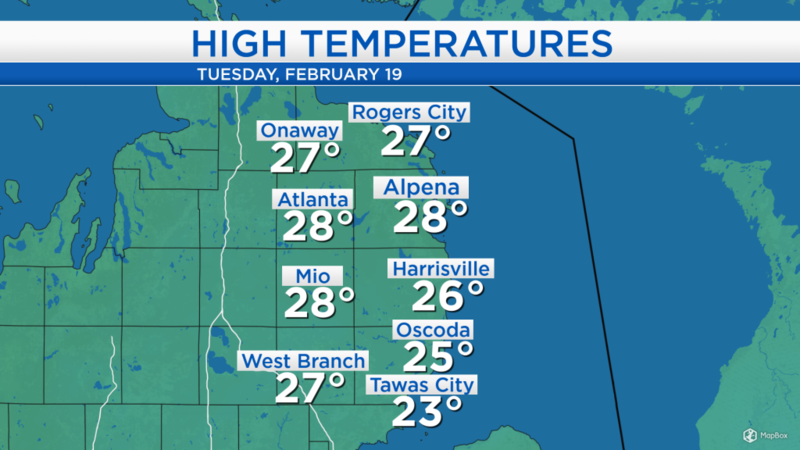 High temperatures will reach 30 degrees, likely in the early-evening. Drier conditions will move in Thursday, although a few flurries are possible in the morning, with highs in the lower 30s. Temperatures will warm to the mid-30s on Friday with partly cloudy skies. A wintry mix (snow/sleet/rain) is possible Saturday afternoon-evening with highs in the mid-30s. A wintry mix with both rain and snow becomes likely on Sunday. For the rest of Northeast Michigan’s weather forecast, watch the latest weather video by clicking the weather tab at the top of the page.